Enhance your designs and take your productivity further. Using GuideSIGN Plus™ provides distinct advantages to your workflow. 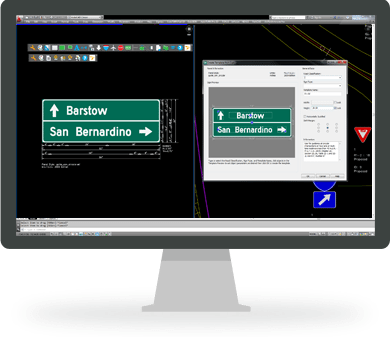 Take advantage of the latest addition to the GuideSIGN product family which sets a new standard for versatility with the ability to precisely place sign assemblies along a roadway. GuideSIGN Plus has all the features necessary to take care of all of your traffic sign design and planning needs. See how the features in GuideSIGN Plus compare to other sign design software. Over 200 new templates specifically created for the MUTCD 2009 with 2004 SHSM, 2012 Supplement.